Ayrshire Housing has completed 22 flats and houses on King Street, the main road into Ayr’s town centre. The development was opened today by pupils from the neighbouring Newton Primary School. The houses and flats are grouped around a courtyard called Cross Gait. They have been designed to a rigorous energy efficiency brief by John Gilbert Architects. Particular attention has been given to air tightness, insulation, and the choice of durable and sustainable materials. The flats have glazed balconies which provide thermal benefits beyond the Building Standards as well as space for clothes airing and relaxation. All the dwellings have mechanical heat recovery ventilation systems. Prestwick based Ashleigh Building has built the development to a very high standard – bettering the rigorous air tightness target, for example. The total cost of the project is £3.1 millions. A Scottish Government grant of £1.4 millions made it possible to rent the houses at affordable rents. The balance of the cost is being funded through a loan from Allia who are managing the Scottish Government’s affordable housing bond. South Ayrshire Council’s Depute Provost Mary Kilpatrick was delighted to oversee the ribbon cutting by the school pupils. She said “the partnership with Ayrshire Housing is really important to the Council in reducing the long waiting lists for housing. I’m sure that these houses will become delightful homes for the new tenants”. 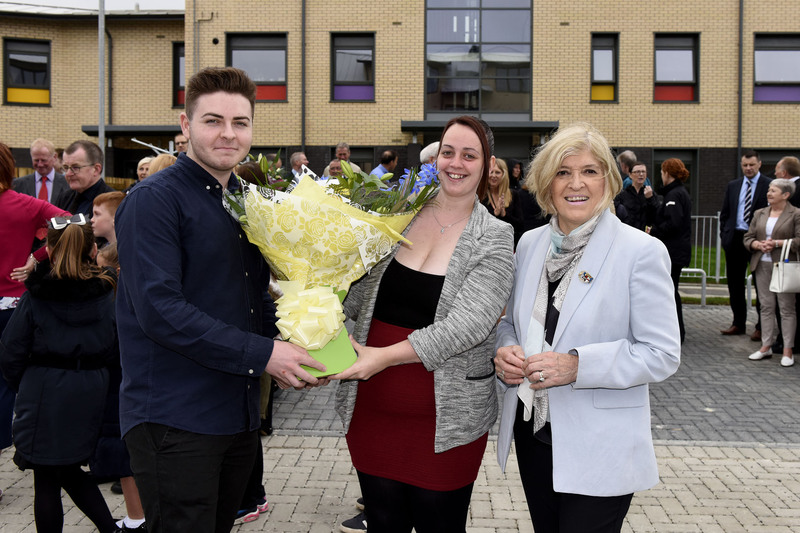 She welcomed siblings David and Natalie (pictured) to their new flat.